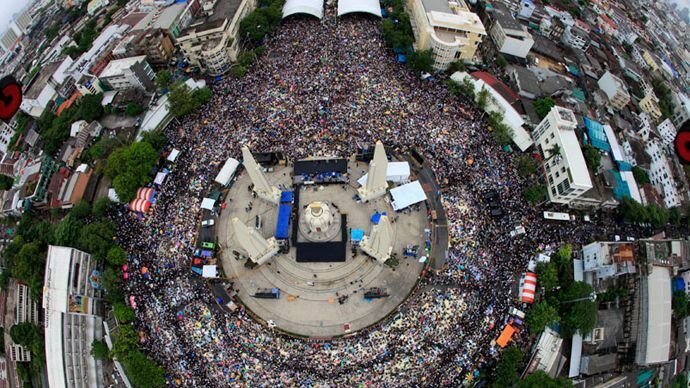 Thousands of protesters in Thailand have forced the closure of several government ministries and vowed to take over government offices nationwide in a bid to force embattled Prime Minister Yingluck Shinawatra from power. On Wednesday, thousands of flag-waving protesters had amassed around at least half-a-dozen of the government's 19 ministries, though many had left by late afternoon. The protesters have managed to shut down five ministries over the past two days. Around a thousand demonstrators loyal to protest leader Suthep Thaugsuban entered a sprawling government office complex in northern Bangkok that houses the Department of Special Investigations (DSI), often likened to the US Federal Bureau of Investigation. “We have ordered the evacuation of the DSI building," Tharit Pengdit told Reuters. "All our employees will be out within half an hour." 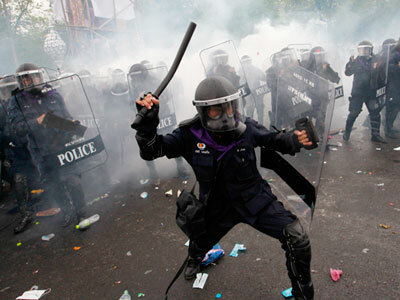 The DSI became the target for demonstrators after the agency recently indicted Suthep, a one-time deputy PM for the opposition Democrat Party. Suthep has been implicated for his alleged role in causing the deaths of more than 90 people in a 2010 military crackdown against the so-called ‘red-shirt’ protesters loyal to ousted PM Thaksin Shinawatra – brother of the current leader. The complex housing the DSI and several other government departments in northern Bangkok, including those handling tax, immigration and land as well as the Supreme Court, has been surrounded by nearly 4,000 protesters. Around 3,000 people gathered at the Energy Ministry, 700 at the Commerce Ministry and 200 at the Industry Ministry, police said. About 1,000 protesters also occupied the Finance Ministry. "I invite protesters to stay here overnight at the Finance Ministry," Suthep told the crowd. "Our only objective is to rid the country of the Thaksin regime." At least six provincial halls in the country’s south were also occupied by protesters on Wednesday who vowed to stay until they received orders from Suthep. The demonstrators, however, did not enter the provincial office buildings or damage any property. 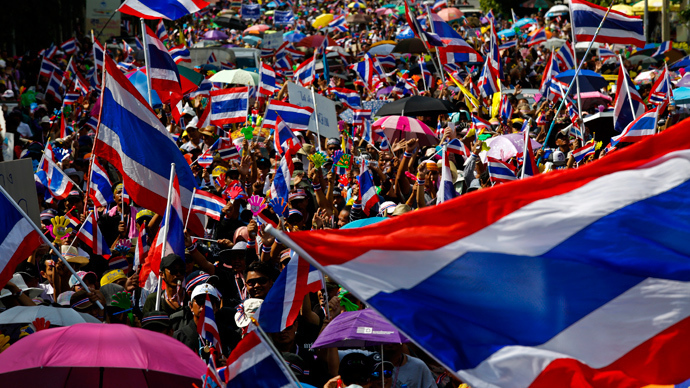 The rallies in the provinces of, Chumphon Phuket, Satun, Songkhla, Surat, Thani and Trang followed Suthep’s televised call from the occupied Finance Ministry for anti-Thaksin protesters in all the country’s 76 provinces in order to shut the government down. According to police, demonstrators in 10 southern provinces gathered in front of government offices despite calls from Interior Minister Charupong Ruangsuwan, who gave governors full authority to “protect” the provincial halls. The demonstrations, which have been picking up steam over recent weeks, center on Thaksin, who has played a pivotal role in Thai politics for over a decade, despite being ousted in a bloodless 2006 military coup. The billionaire telecommunications mogul built his political power via a series of populist measures which have ensured the unfaltering allegiance of the rural poor, who twice voted him into office in 2001 and 2005. His government faced allegations of corruption, authoritarianism, and suppressing the press. Thaksin was personally accused of tax evasion, lese majeste (insulting revered King Bhumibol – a major crime), and selling off assets of Thai companies to international investors. After briefly returning to Thailand in 2008, he was convicted by a Thai court later that year of corruption and sentenced in absentia to two years in prison over a controversial land deal. 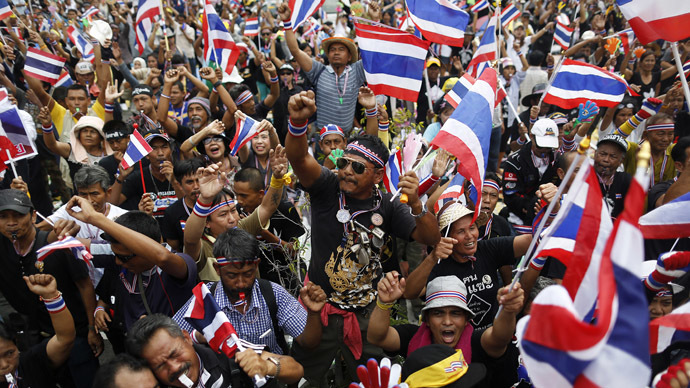 The anti-government campaign, steered by a coterie of rich and powerful conservatives, military brass, bureaucrats and royalists with influence over the country’s urban middle class, kicked off in October after Yingluck's ruling Puea Thai party tried to pass an amnesty bill. Critics say the bill was designed to clear Thaksin of his corruption conviction, with Suthep, vowing to wipe out the "political machine of Thaksin." Fearing a similarly violent crackdown could rob her government of legitimacy, Yingluck has vowed not to use force. “This is not the 'Thaksin regime', this is a democratically elected government," Yingluck told reporters outside parliament, where she has faced a grueling two-day confidence vote. "We must not regard this as a win-or-lose situation," she continued. "Today no one is winning or losing, only the country is hurting."